We had a very mellow holiday, just like I like them! 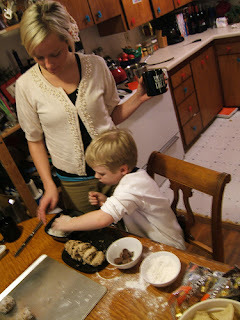 Bree came over with her son, Oliver to do some baking on Sunday. Darian had a friend over too and they made bread while Oliver made chocolate chip cookies. I made hot spiced cider and wine. The whole house smelled like Christmas. We watched Muppet Christmas and then called it a night. The next day they came over for a big Christmas Eve turkey dinner. Since I was SO very sick on Thanksgiving, it was really fun for me to pull out all of the stops and make a big old dinner. It was kind of my Thanksgiving and Christmas dinner all rolled into one. Delicious! Darian really made out like a bandit in the gifts department this year. By the time she opened her last gift she actually had tears in her eyes, a giant smile and she said she could cry she was so happy. 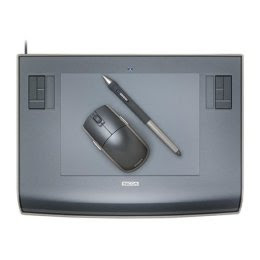 She got a huge stack of video games for all of her various game systems, some movies, and a bunch of other stuff, but her big gift this year was a Wacom Intuos3 USB Tablet - 6x8. This is something she has been wanting for a very long time. She's become quite the little artist and this will help her in that pursuit. She has already started working with it, and has made some really cool stuff in Photoshop. I have a feeling this tool will help take her art to the next level. Something else that Darian got was Singstar for her PS2. If you are not familiar with this game, it is like Guitar Hero but with microphones and singing. You sing along with music videos and you try to get your voice as close as possible to the singer in the video. She got the 80's version, so of course, Jon and I were gonna have some fun with it as well. Christmas Eve and Christmas morning turned into a sing off. Jon, having the clear advantage, beat me by 30 points singing Madonna, Like a Virgin and Blondie, Heart of Glass. I beat Jon by almost 100 points singing Wake Me Up Before You Go-Go by Wham (More than once! Guess I got some GM in my soul? Haha!) I also beat him singing a Twisted Sister song called We're Not Gonna Take It. So, I won on the boys and he won on the girls. This makes no sense to me. Darian said that it is because he has a high voice and I have a low voice. Now we can't wait to get them all! I see many Singstar parties in our future! So, that was our Christmas. Now on to the New Year! Many warm fuzzy blessings to all of you who read this. I hope you have a beautiful New Year! Sounds like you had a fantastic time. I would have loved to witness the Singstar sing-off, bet that was awesome.